I was glad to learn that Amy Novotny’s Nikon TC-E-20 (teleconverter) sold the first day it was listed. Both Fall Fort DeSoto IPTs are wide open — click here and scroll down for more info. Details for the 2019 UK Puffins and Gannets IPT will be announced here very soon. We will be visiting Seahouses for the puffins and other seabirds and both Bempton Cliffs and Dunbar (two boat trips) for gannets (and more). If you are interested in the pre-publication details, please shoot me an e-mail. Limit: 10 photographers. 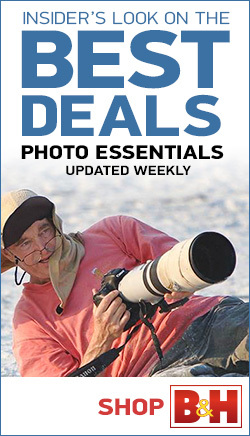 Anthony Ardito sold his Canon EF 24-70mm f/2.8L II USM lens in like-new condition for $999.00 in mid-August. This image was created on June 30, 2018 at Bempton Cliffs, UK with the Induro GIT 304L/Mongoose M3.6-mounted Nikon AF-S NIKKOR 600mm f/4E FL ED VR lens, the Nikon AF-S Teleconverter TC-14E III, and my souped up Nikon D850. ISO 800. Matrix metering +1 2/3 stops off the grey sky: 1/5000 sec. at f/6.3 in Manual mode. Natural Auto WB at 4:43PM on an absolutely clear afternoon. Center group (grp) Continuous (AI Servo in Canon) shutter button AF was active at the moment of exposure. The upper point in the array was on the top of the gannet’s head; that is about as good as I can do. While the unusually clear, sunny, warm weather made things tough on us on several mornings, the afternoons were spectacular. 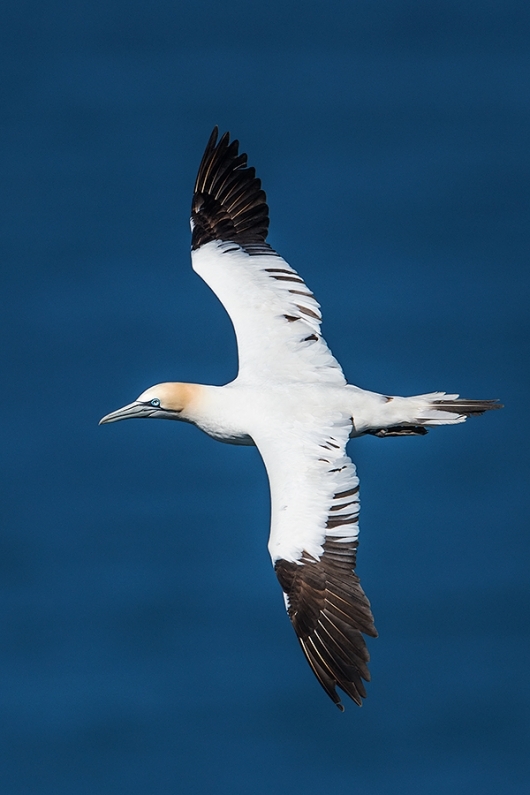 The gannets consistently fly by below eye level offering unlimited chances for spectacular top shots, images of birds in flight showing the dorsal wing surfaces. On some winds you can use your hand held intermediate telephotos and do just fine. On other winds a longer lens is often the best too. Though I did try to create some vertical originals, today’s featured image is a crop from a horizontal original. The blue sea is underexposed by half to one stop, therefore the plus one and a half off the grey sky was an incomplete correction for medium grey; perhaps deliberately to improve rendition of the white feathers. Seriously though, I would say the patch of ocean in the shot is in the shade whereas the bird is in full sun. Nope. Both were in full sun. If you expose for the whites (or, at 240, actually underexpose to reveal detail), all other tones (including the mid toned eye/ocean) will be correspondingly underexposed as well and hence look darker. Hi Artie, the answer is you exposed for the whites. Tha caused the mid tones and darks to be under exposed. Concise, correct, and well stated. Hi, Artie. I don’t find that the ocean does look too dark, although a common reaction to my top shots of white birds, including from you, is that the ocean is too dark. The only thing I can think of is that in an image like the above fine shot of a gannet, the focus is on the white bird, which occupies a substantial part of the frame; by contrast the ocean looks pretty dark. In real life, the gannet isn’t much more than a speck of white on a blue ocean and so you see the ocean as lighter. In five words? The white overpowers the darker blue. Seventeen more. Why? Because the white bird occupies more of the frame than would be the case in nature. Reducing the brightness of an ETTR image plus reducing the whites/highlights to around 230 would optimise the appearance of the gannet. The water is made up of both light and dark tones. Reducing the highlight tones in the gannet would also darken the lighter tones in the water making it appear darker than it was in the original scene. You could adjust the blue saturation and/or luminance either using HSL in Lightroom or on an HSL adjustment layer with or without a selection in Photoshop.